Perfect Size For Tealight Candles! Clear Glass Tealight Candle Holder Set of 72 from Quick Candles. Quality Products and Quick Shipping! and burn time, or to change the lighting effect, a Glass Tealight Holder is needed. 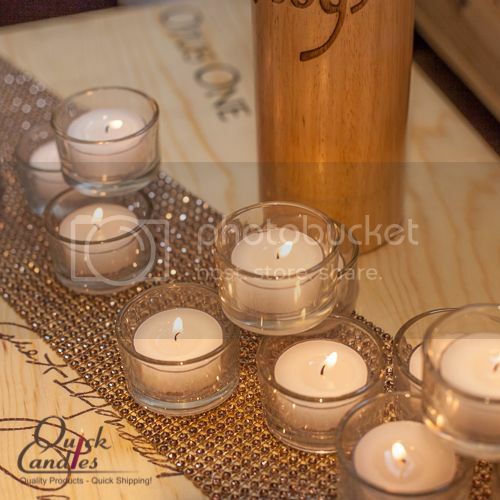 Quick Candles recommends using our Tealight Candle Holders to achieve the best results. Our Clear Glass Tealight Candle Holder is great for restaurants, promotional events, parties, receptions, weddings, and home decor. We offer a Clear Glass Tealight Holders , Frosted Glass Tealight Holders and Square Tealight Holders. They all work exceptionally well with our Tealight Candles. Our selection of Tealight Candles includes White Unscented, Vanilla Scented, Mulberry Scented, Apple Cinnamon Scented, Lavender Scented , Pink Gardenia Scented and Blue Ocean Breeze Scented Tealights. While you're here, you'll want to check out our Votive Candles and Glass Votive Candle Holders, too. We stock the same colors and scents in Votive Candles as in Tealight Candles. Compare and save.